Our juices are sold around the country, and enjoyed by most major resorts and hotels in Hawaii, the juice "capital". 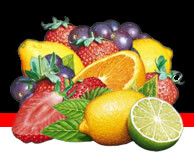 They contain higher levels of real fruit juices than competitive brands, just compare the label! Our orange juice comes from 100% Florida oranges. The juices are packaged in 3-gallon bag in boxes, and are pasturized for freshness. They can be used in countertop dispensers or on bar guns. In addition, we run seasonal flavors such as Strawberry Lemonade and berry granita syrups. Please contact us to see other flavors available!